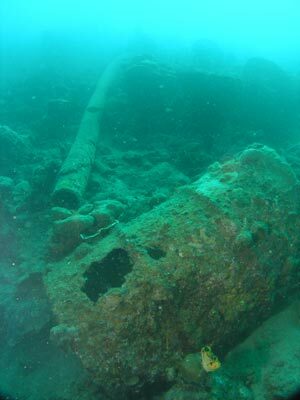 When you visit Tulagi in the Solomon Islands for diving, you generally do not go there to dive reefs. The main attractions are three World War II warships, sunk with all guns blazing and some other War casualties like Japanese aircraft and landing craft. 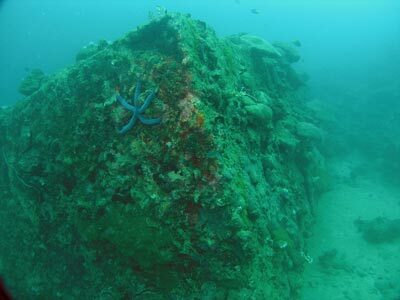 However, there are some reef dives (like Twin Tunnels) and some dives that are mixed reef and wreckage, like this dive. The dive shop at Tulagi has its own wharf right in front of the shop and the accommodation, the Vanita Motel. The water off here drops pretty quickly to over 25 metres and even more. To the left and right there are dives that are worth doing if you do not want to do a second deep dive in the afternoon. About 100 metres south of the Vanita Motel are the remains of SML Base No 2 (SML is Sasape Marina Ltd). The property has wharves, a slipway and some buildings. There is a wreck of a vessel up against one of the wharves and it is sometimes used by a landing craft that brings over vehicles for maintaining the road around the island. This dive is from the dive shop area to the waters off the base and back. To do this dive, you gear up in the dive shop and then walk across the road to the wharf. Luckily it is not a long walk as I did this dive with the twins that I was using for the deep dives. To the left of the wharf is a set of steps that leads to the water. Do not use the ramp to the right as this is slippery. Once in the water, put on your fins and manoeuvre past the dive boat/s and then drop to the bottom. The depth here is only about two metres. 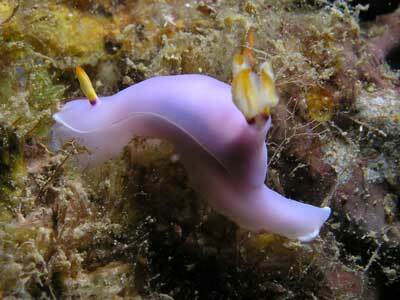 Head north-east and the depth drops very gradually on a sandy bottom to about seven metres. This is about 30 or so metres off the shore. About here, the bottom drops away very quickly to about 22 metres. The sandy slope is dotted with coral. Most of it is dead, but there is some live stuff. 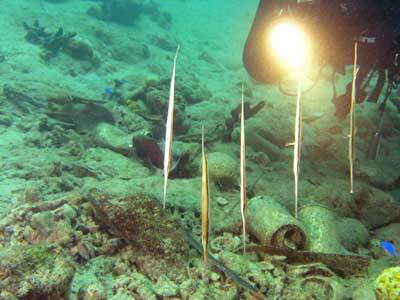 There are also lots of funnel sponges. Most of these are alive but some are dead. 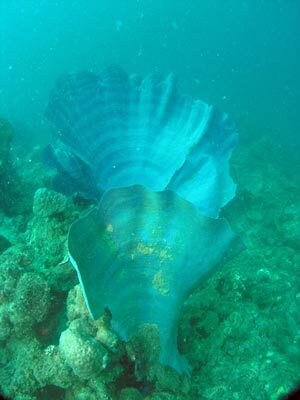 The funnel sponges are, as the name suggests, funnel shaped and the sponge is a thin sheet that is about 3 or 4 mm thick. This is a sort of corrugated texture. Once at the bottom of the main slope at 25 metres (it continues to get deeper very gradually), turn right and follow at this depth as you head roughly east. The slope winds in and out but roughly continues in the same direction. As you pass the Police Station, you will come across some huge box-like objects. These appear to be the pontoons for an old wharf. There is one by itself and a few metres on, three joined together. All around these there is a lot of fishlife. As you move further along you will start coming across more and more junk. This is from the base. There are sections of steel, pipes, suction pipes and wooden beams. 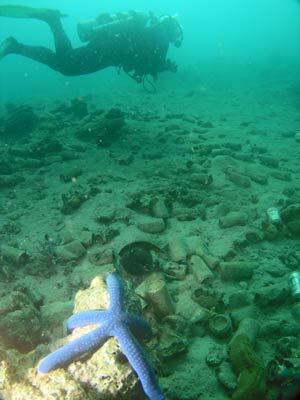 Once of the suction pipes winds up and over the reef towards the shallows like a snake. After about 30 minutes or so, you probably will need to come up a bit as the bottom time will be running out. This is probably a good place to turn around as well. When you move back up a bit shallower you will see even more junk. The main thing is there are thousands of beer cans. You do not find beer bottles here as they have a deposit on them (good reason for the rest of Australia to implement a deposit scheme like South Australia!) and they get refilled but aluminium cans are worthless as it would cost too much to collect and send back to Australia to be recycled. There are also lots of fish in the shallows. 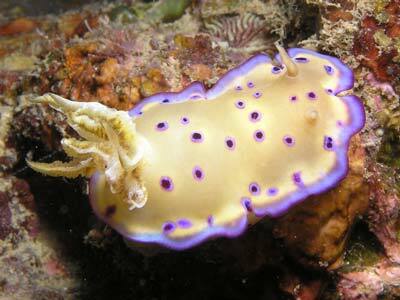 You should also see quite a few interesting nudibranchs and some cuttlefish. Back towards the Police Station you will probably see a school of razorfish. These strange looking fish are shaped like a razor knife and swim with their heads down and tails up but move forward in the direction of their spin. We actually saw a couple of schools of them on this dive, one of about 10 or so and a smaller one closer to the exit of about six. 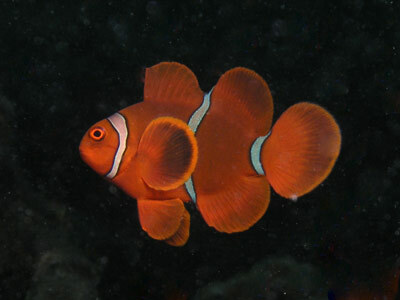 Along the way you should also see anemones and clownfish. There are quite a few along the top of the wall/slope. 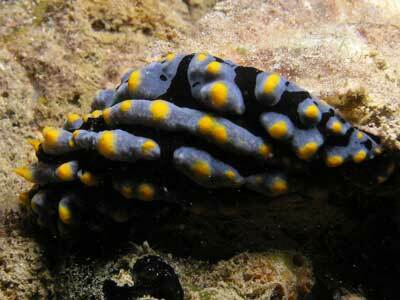 You will also see bannerfish, Moorish idols and various triggerfish. Finally, after about 50 or 60 minutes you will come to a flatter area on top of the slope that is at about three to four metres. You can spend a considerable amount of time here as there is some interesting things to see (like anemones, clownfish, razorfish and more). If you come to a rock wall, then this is just to the south of the wharf. Go back under the wharf and exit at the steps. This is a nice, easy dive, with some interesting things to see. 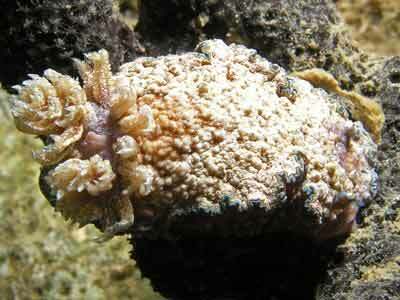 It is a good shallow dive after doing a very deep and long first dive or after doing many days of deep dives. There is no current to consider, the visibility was about 20 metres and the water temperature was about 27ºC.